Nothing beats waking to the soft touch of day break under sheets you do not want to leave. DEIA Living products provide the slumber you need to feel refreshed every morning. 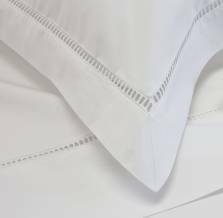 Being made by Europe´s best artisans our collections come in thread counts between 280 – 600TC in percale and sateen. Our manufacturers follow the stringent quality controls of the OEKO-TEX® 100 to ensure sweet dreams every night.